In the couple of days leading up to the finale of Serial, the new NPR podcast that has gone viral in a “not this many people actually listen to NPR” kind of way, I spent some time reading the subreddit devoted to the show. I study social computing, fandom communities, and law, and suddenly these things had collided for me in an unexpected way. One of my observations of fandom communities has been the double edged sword of theories and debates. Sometimes speculation is a fun, community-building activity that helps to keep interest alive in between installments of a television show or book series. But sometimes being so invested in your own ideas about something can begin to ruin the actual experience. This is something I’ve observed from the outside: watching people get legitimately angry when their theories don’t pan out. I’ve even experienced this somewhat myself. When I was in high school I wrote Star Trek fan fiction. I remember being upset when an episode of Deep Space 9 jossed some idea I had about Ferengi culture. C’est la vie. Meanwhile, in what I thought was a completely unrelated topic, my dissertation involves in part people’s misconceptions about the law, and how misinformation can propagate in online communities with no real signals of expertise. In the case of copyright law and online creativity, misinformation and confusion can result in chilling effects and less art for everyone. Something I’ve observed is that copyright is an area where people often know just enough to be dangerous — this is why, for example, even though I as a copyright expert am pretty darn sure that my Barbie remix was fair use, I was condemned by some Internet commentators for infringing Mattel’s copyright. In other words, my journeys through legal conversations in online communities have whisked me by lot of armchair attorneys. In fan interactions surrounding Serial, suddenly these topics of media fandom debates and armchair attorneys were related. 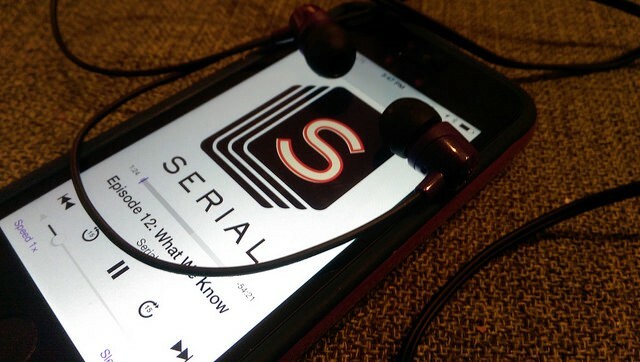 Serial is not the first true crime story, of course. But what makes it feel different than, say, In Cold Blood or Zodiac, is the serialized nature. Most of the time, we read a book, we watch a film, and we might discuss it with some people, but then it’s over. There is a reason why most really big media fandoms–think Star Trek, Harry Potter, Game of Thrones, Doctor Who–are based on television or book series as opposed to one-shots. A big part of what builds a fan community is the fervor of speculation in between serialized elements; it keeps the media alive and serves as a sort of support group during the wait between installments. And this is what we see, most notably, on the Serial subreddit. Some of the most interesting interactions to me are when members of the community step in to remind each other that they’re not talking about something fictional. Reminders that at the heart of this there is the real tragedy of a murdered girl. There is a prominent reminder on the comment box to be respectful, and to not post last names or other identifying information. Apparently at some point people found Jay’s Facebook page. Another time some private information about host Sarah Koenig was inadvertently made public. Community members also often seem self aware about their relationship to fandom. For example, someone compared some interactions unfavorably to the Song of Ice and Fire subreddit where apparently writer George R.R. Martin gets his share of abuse: “You guys are as nuts as /r/asoiaf, except they’re talking about fiction and you’re wildly speculating on real, living people.” I started writing this before the final episode aired, and I admit, I worried that the analogy to fandom entitlement might be anger over a lack of resolution. But mostly what I’ve seen is just more and more speculation–without resolution, it can just continue ad nauseam. It’s interesting that part of what that makes fictional crime stories so satisfying–a resolution, an ending–is the same thing that makes them unrealistic. In Serial fandom, this satisfaction is replaced by a sense of reality and of closeness to the source material. In debating the finer points of Game of Thrones continuity and worldbuilding, the only thing that makes someone an expert is being a really close reader or viewer. It isn’t as if an actual dragonrider can chime in and set someone straight on a question of dragon anatomy, for example. But for Serial, suddenly actual expertise is incredibly important. There is even “flair” (labels by your username) in the subreddit that mark community members as self-identified lawyers. But the intensity of fandom debate is a little different when it’s over real rules of legal procedure and evidence than over the rules of magic in Harry Potter. This isn’t the first time that Redditers have been armchair detectives either. The well-publicized misidentification of a Boston bomber suspect had some asking whether Internet sleuthing might do more harm than good. However, an attorney at the Innocence Project, who is continuing to investigate the case, said that they have taken into account information they have been sent from fans, including a potential suspect (who I can speculate is this one, never discussed on the podcast). This all left me wondering: could fannish commitment to a theory and a real, high-stakes case be a bad combination? Because I can see how there might be negative outcomes of “Team Adnan” becoming too much like “Team Edward”. I remember a story years ago of how, for example, a group of fans of Harry/Hermione as a couple in Harry Potter planned to take out an ad in The New York Times, condemning JK Rowling for sinking their ship in the sixth book. I can imagine “real world” analogies to this that may be something like what happened when people began visiting Jay’s Facebook page. As someone who sat through semesters of law school classes on endless details of rules of evidence and criminal procedure (not to mention reviewing it all for the bar exam), I can guarantee you that there’s more to proving a case than can be learned on Law and Order. Perhaps like copyright, criminal law is an area that people can know just enough about to be dangerous. I have seen legal scholarship that points to both good and bad outcomes of “the CSI effect,” where jurors might expect a large amount of forensic evidence at trials because of what they see on television. However, in the end, verdicts are made by jurors not lawyers–people just like the Reddit fans who have paid very close attention to all the evidence provided to them. Sarah Koenig ended the podcast with her opinion as a juror, not a journalist or a lawyer. In fact, I would argue that fans with experience combing through textual evidence to form theories would make the very best jurors. I am curious now what will happen to the fan community around Serial now that it’s over (and apparently the next installment may not even focus on a crime). Will they follow the show or follow the crime? Maybe they are less a fandom after all, and have become more a community of detectives. There are probably interesting research questions here about crowdsourced justice, but I will leave those thoughts for another day. I can’t seem to find any references to this now, so take this memory with a grain of salt. Also, this story as I recall it ended with the group being talked out of his course of action. Originally published at caseyfiesler.com on December 20, 2014.